When I converted to Catholicism in 1996, my wife could not in good conscience follow me. She became a Missouri Synod Lutheran. Both our new affiliations were a change from our Presbyterian heritage but at least the Presbyterians and Lutherans hold the doctrine of justification by faith alone in common. For fourteen years, Sharon attended Mass with me and I attended her Missouri Synod congregation until in October 2010 she became a Catholic. Sharon and I had many conversations over the years about the doctrine of justification. Still today there remains much confusion among Catholics and Protestants over this question. 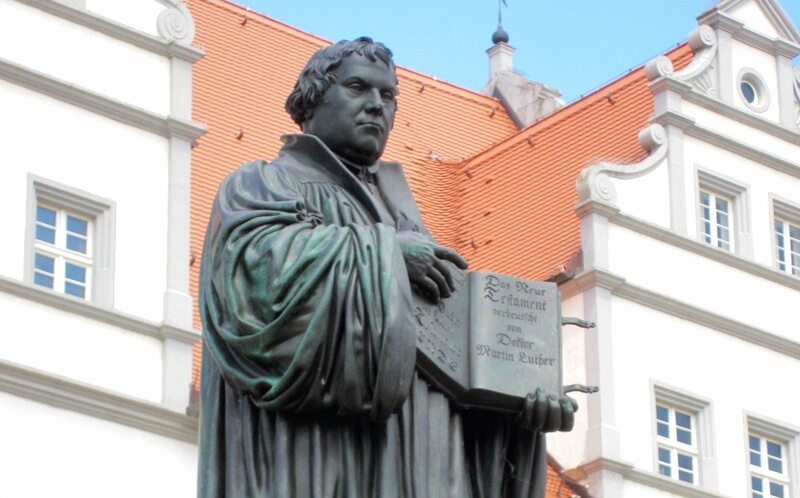 Martin Luther said that justification was the one doctrine on which the church stands or falls. If the church got this doctrine wrong, nothing else could be right. The purity of the gospel of Jesus Christ was at stake. Convinced Lutherans still hold this standpoint today. To understand why, we need to review the history. The protest of the sixteenth century that became known as the Reformation was a complex historical movement with many facets but, from the point of view of doctrine, one of Martin Luther’s most famous declarations stands out above all. Sinners are justified by faith alone as they trust in Jesus Christ. As a Presbyterian minister, I preached many sermons in which I gloried in the righteousness of Christ as our only hope of salvation. For a knowledgeable Protestant, salvation can only come through Christ alone (solus christus) by the grace of God alone (sola gratia) and only through the instrumentality of faith (sola fide). This excluded any help from human resources, be they the living or the dead (saints). It excluded any work on our part. Works are important in the Protestant faith but they make no contribution to our salvation; they only give evidence that we have been justified. It is God’s favor alone that saves (sola gratia). Most important of all, it must be only by faith because to add anything else to faith would cause our salvation to revert back to human effort. Protestant Christians loathe the idea that human power could save us. Trusting in human effort was the pernicious error of Romanism. Rome compromises God’s grace by making works a part of salvation. Or, so I thought. 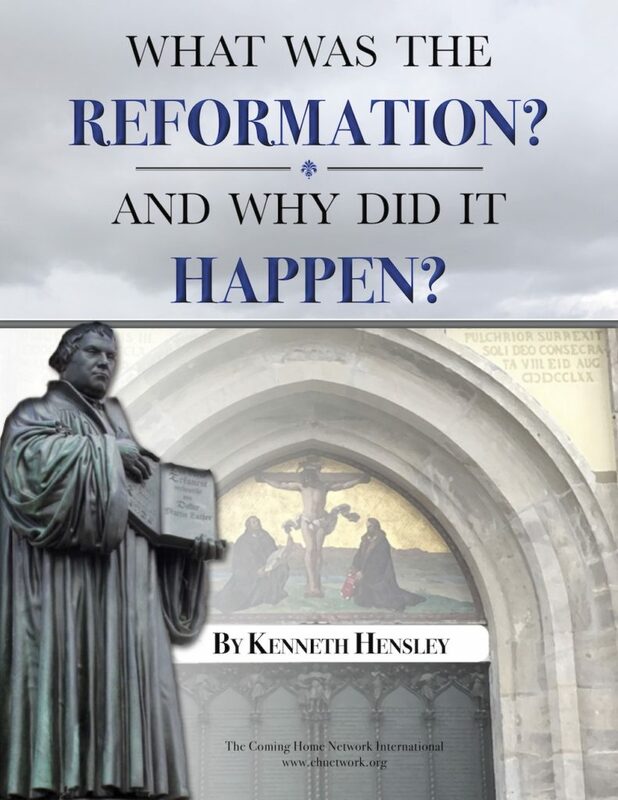 The true differences between the Reformation and Catholic view become clear through patient and deliberate study. The Catholic view of justification is rooted, like everything else in Catholicism, in the reality of the Incarnation. When the Holy Spirit came upon the Virgin Mary in her womb and brought the Eternal Logos to her, God became flesh (Jn 1:14). The purpose of the Incarnation was to unite divinity with humanity forever. As St. Athanasius would put it, “the Son of God became the Son of Man that the sons of men might become the sons of God” (cf. Jn 1:12). Both Protestants and Catholics believe that Jesus Christ is, after the Incarnation, forever the God-Man but it is only in Catholicism that the Incarnation fits into the plan of salvation in the fullest way. The Reformation doctrine of justification does not include, or at least does not emphasize, the union of human beings with God. Its doctrine is one of imputation, a legal declaration in which human beings are declared righteous before God’s presence. In this view, it would have been sufficient for the Eternal Logos to become man, to suffer, to die on the cross, and to rise from the dead so that the merits of His death could be imputed to the sinner’s account. There does not seem to be any further need for Christ to remain a man in heaven. He could have simply shed His humanity and returned to heaven in His divinity. In fact, I recall hearing Protestant Christians say occasionally that Jesus was no longer a man in heaven. I don’t think this was just a matter of bad catechesis. Their system of thinking doesn’t seem to require His continuing humanity. The Catholic view of justification is infusion, a process in which God fills the human soul with His presence and therefore with His mercy, grace, and power. The permanence of the Incarnation makes more sense because the goal of God’s redemptive plan is not just legal imputation but the uniting of Himself with human beings forever. A union took place first in Jesus Christ and it is that union which He shares with human sinners so they can grow into the fullness of their humanity by being made increasingly divine. In this view, the sacraments acquire a more direct relation to salvation. Beginning with baptism, the sacraments infuse God’s grace into the human soul and make it conformed to the image of Christ. Christ’s merits are not accounted to the sinner’s account but poured into the soul of the sinner. Infusion implies a process, not a one-time act. In the Protestant creeds, justification is defined as an act of God’s grace since it is an imputation of righteousness. In the Catholic view, God’s grace is gradually poured into the soul of the believing Christian. The Angelus, a standard Catholic prayer, expresses it well, “Pour forth, we beseech you, O Lord, your grace into our hearts that we, to whom the Incarnation of Christ your Son was made known by the message of an angel, may through His passion and cross, be brought to the glory of His resurrection.” So, salvation is a process of growing in God’s grace over a lifetime. One can be more or less justified whereas in Protestantism, one is either justified or not justified. In Protestant theology, sanctification is a process of growing in holiness but that process does not affect the state of one’s justification. In Catholic theology, justification and sanctification are two biblical words describing the same process. The process of sanctification or justification is, in the Catholic view, one of constant purgation, illumination, and union. Purgation is the removal of sin and the inclinations to sin known as concupiscence. As the Christian receives more and more grace, he grows less inclined to sin and more inclined to obey God. If this purgative process is not complete at death, there remains a final purgation after death for those who die in a state of grace and are destined for heaven. Purgatory makes perfect sense from the Catholic view but absolutely no sense from the Protestant view. The removal of sin and the accompanying propensities to sin are not enough; a person on the spiritual journey needs illumination, an infusion of the knowledge of God. As a person becomes holier through purgation, their vision of God, the world, and themselves becomes clearer through illumination. Paul used such language in praying for the Ephesians, namely, “that the eyes of their hearts might be enlightened” (Eph 1:18; see also Col 1:9-11). The final end of this process is complete union with God known by the medieval theologians as the Beatific Vision. It is what Jesus spoke of when He said, “Blessed are the pure in heart for they will see God” (Mt 5:8). En route to the Beatific Vision, the ordinary Christian engages in works of grace, that is, works motivated by grace. And here is where Protestants are likely to misunderstand the Catholic view. In Protestantism, works are evidence of genuine faith. They are necessary because without works one cannot know whether one is saved. Works are motivated by grace but they do not contribute to one’s justification since that act has already been completed by God. Works only show us whether that act has occurred or not. In the Catholic view, good works are motivated by grace and open up our hearts to receive more grace being poured into our souls. Grace does not come from us; it comes from the merits of Christ. Christ alone can merit heaven and our final union with God but He must communicate those merits for us to have any hope of the Beatific Vision. Good works are the ongoing means of Christ communicating His merits; works can include prayer, obedience, sacrifice, sufferings, and acts of charity. They help us cooperate with God by expanding our hearts to receive more of God. This all explains the importance of the Eucharist in the Catholic view of justification. If justification is a process of becoming more and more just through the infusion of grace, there has to be a means by which that grace is continually infused into our souls. The answer lay in the sacraments and preeminently in the greatest of the sacraments, the Eucharist. All the sacraments give grace but only the Eucharist gives the Author of grace. The Eucharist gives grace not only in a generic sense; it gives Christ Himself in the fullness of His humanity and divinity. As is often said in Catholic life, it gives the body, blood, soul, and divinity of Christ. Here too is the reason for Jesus being forever the God-Man. In the Incarnation, divinity was united with humanity in the Person of Jesus Christ. The union of divinity and humanity is communicated to the Christian through the holy Eucharist. The fundamental mistake of justification by faith alone is that it transfers the once-for-all-ness of Jesus’s death — the objective part of redemption — to God’s act of forgiveness in response to our faith, the subjective part of redemption. If you believe that all sins — past, present, and future — are forgiven in one act of declaration made by God at the moment of faith, then there is little reason to ask for forgiveness in the future. Why ask forgiveness for sins already forgiven? Yet Protestant Christians do ask forgiveness for their daily sins. Something is wrong in either their theory or their practice. I think their practice is right but their theory is wrong. In the end, the Protestant view of salvation is insufficient, lacking the fullness of the Christian Faith. While not everything in the Protestant view needs to be rejected, the Catholic understanding represents better the teaching of the whole New Testament (plena fides). If the Catholic view had been what most Protestants thought it was — salvation by works or faith plus works — I would have rejected it and still be a Protestant today. The Catholic view is truer to the New Testament and agrees with the Church Fathers better than the imputation view. To relinquish justification by faith alone (sola fide) and embrace the fullness of the faith (plena fides) is not to reject everything in one’s Protestant past. It is to find a fuller and richer context in which to put that past into practice. This all has an important practical application. The doctrine of salvation and heaven does make a difference. I never saw in the Protestant Christians the yearning for holiness I have observed in some Catholics. I didn’t have yearnings to such a degree nor do I think I saw it in others. I have seen a life of prayer and holiness in some Catholics that borders on the phenomenal. I now think I know why. If you view yourself as already saved, then there may be less reason to pursue a life of prayer and holiness. Since Catholics view their salvation as an ongoing project of conversion, consisting of justification and sanctification, they are motivated to pursue holiness to a much greater degree.